Looking through the photos I took of my daughter this morning — her in her pajamas leaning back against my thighs, my bare feet in the tangle of blankets in the background — I remember there are so many things about being a mother that are exactly as I imagined: the awe I feel when I look at my daughter, Esmé. The love I sense when I stare into her beautiful deep blue eyes. The pride that blossoms when I sink my fingers into her unruly curls, claiming her as my very own. These blurs are the contrails of her stereotypies, her choreoathetoid movement disorder, her flailing attempts at communication. They are the intangible made visible, photographic reminders that being Esmé’s mother is also nothing at all like I expected. 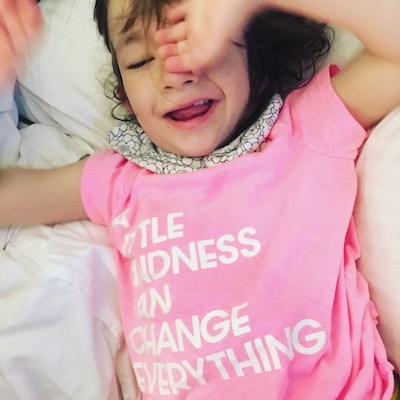 They are the evidence of the blur I struggle to articulate: how the fear and pain associated with my daughter’s rare diseases can co-exist with the tremendous gifts that have come out of her conditions. From the day she was born, Esmé struggled to breathe, eat, and move with purpose. As she grew, the differences between Esmé and her peers grew as well. Now, at five years old, Esmé is unable to walk, speak, or eat by mouth. She takes large doses of benzodiazepines in order to combat her severe epilepsy. She collects obscure sub-specialists like neuro-genetic epileptologists and autonomic cardiologists. However, she also distinguishes herself by excelling in a number of respects: in smiles, determination and reading skills. Esmé is also clever, funny, and loving. She is beautiful, impish, and unrelentingly enchanting. Some of Esmé’s differences appear to stem from multiple genetic mutations, including mutations in the genes PCDH19 and SCN8A. Each of her mutations is quite rare. The current diagnosed population of individuals with PCDH19 and SCN8A are approximately 500 and 140, respectively. Her other mutations are even more rare. What each mutation contributes to Esmé’s condition is currently a mystery, but it is a mystery that a number of dedicated scientists are trying to sort out. A mystery that has led to some very surprising places. For the years leading to the discovery of Esmé’s mutations I clung, with all of my might, to the idea that a diagnosis was the goal. I imagined the diagnosis would connect us to a huge, helpful welcoming community, filled with children just like my daughter. I imagined that the diagnosis would lead us to hope, to plenty of medical research and clear medical treatment plans. But, instead, what I found in each of Esmé’s extraordinarily rare diagnoses were more questions. In ways, her diagnoses left us more isolated and alone than ever, and more afraid for Esmé’s future than ever. When we founded The Cute Syndrome Foundation the goal was to fund research for rare disorders, first PCDH19 and then SCN8A, in the spirit of that hope. A hope for Esmé, certainly, but also something much bigger than that. Almost three years down the line, together with our partner organizations, we have helped to fund around $250,000 of medical research. We also support important awareness projects like our recent SCN8A Researcher, Clinician, and Family Gathering — during which scientists and families were able to share valuable knowledge. And while Esmé’s particular disorders remain mysterious for the time, I also believe we are on our way to unraveling more about what makes Esmé who she is. And while it might be tempting to try to end this essay on a note of clarity, the truth is we are a long way from many of the answers we seek. And the ones we’ve found so far? They are pretty blurry. Hillary Savoie is a writer, advocate, and mixer of killer cocktails. She is also mother to Esmé, a beautiful little girl with multiple rare genetic conditions. Since Esmé’s birth in 2011, she has done her best to keep up with the plan in her daughter’s genes, embarking on seemingly unending journey into the place where science, medicine, and love collide. Hillary is a features writer on Romper.com, where she writes about parenting a child who is medical fragile and reports on topics like caregiving shortages for individuals with developmental disabilities. Her writing has also appeared on Motherlode, the New York Times parenting blog, BUST, and The Mighty, among others. She also has a YouTube channel called Ask Esmé’s Mom, in which she vlogs responses to difficult questions about raising a medically fragile child. Hillary is the Founder and Director of the Cute Syndrome Foundation and holds a doctorate in Communication and Rhetoric from Rensselaer Polytechnic Institute.